Electronics and Data Acquisition (or ‘DAQ’) are two separate disciplines, although they work together in unison. The car relies on a few key electronic subsystems. The Engine Control Unit or ECU ensures all engine events occur at just the right time for maximum performance. An electronic, or “drive by wire” throttle controls engine power. Smaller systems include the steering wheel, various safety devices and 12V power management, amongst many other things, connected by the wiring loom. A Data Acquisition system will capture data from the car which is invaluable for both real time performance monitoring and post-race/test analysis. Having trustworthy data lets the team quickly and effectively verify designs. We will create a circuit powered by a MyRio which measures many different variables which we can then use to analyse how the car performs and create systems which use the data to enhance the performance of the car. We will work on wiring and programming an electronic throttle. This will allow more accuracy and precision when it comes to controlling the car. 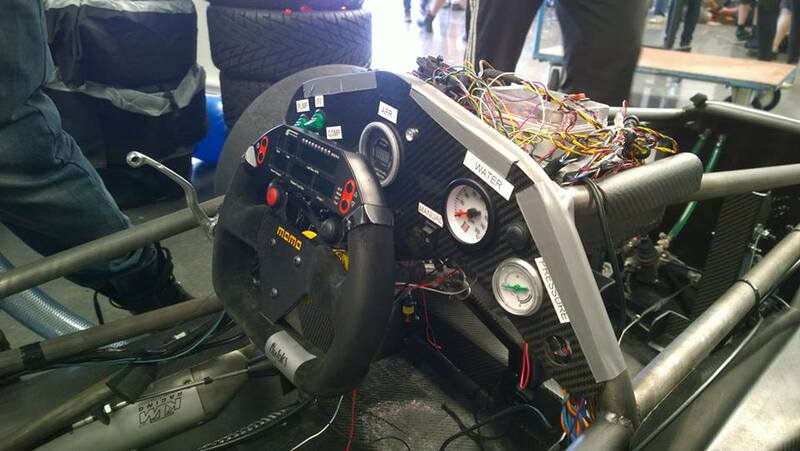 It also means we can create electrical systems which rely on controlling the throttle. Our final project will be a traction control system which uses the DAQ to recognise when the car has lost traction and then adjusts the air/fuel mixture in the engine (via the electronic throttle) to help the car regain traction, improving control and speed within the car.